I miss it. I miss my boys’ younger ages. I miss reading to them for hours after they begged me to sit on the floor with them. I miss the hours of LEGO building, creating. I miss sitting at my computer and typing up the details about the fun ways we learned and practiced our letters, we created or the bubbling mess of an experiment we tried that made our kitchen all wet the first time we tried it! See, the boys have been in school full days for a few years now. When Sweet Pea first entered Kindergarten I realized how much I like to tinker with the back end of this blog. I took the steps to learn more, spending hours behind the computer soaking up all the information I could. Sometimes I sat there too long but was always careful to do it when the boys were at school, always giving them my attention when they were home. I slowly let posting the fun things take a back seat to my learning, stopped looking for as many fun experiences to enjoy with them. Oh, I know this isn’t just because I’ve spent time at the computer and grown in my skills. I know as eight- and ten-year-olds they just play differently and aren’t as dependent on me, which is nice and gives Hubby and me more freedom because they are growing into young men. This “missing” is perhaps a little emptiness, a feeling I suspect many moms experience but don’t have the time to acknowledge because they are so busy with life. This post is my realizing that it is ok, normal, a process that some don’t realize even happened until their kids leave home and live on their own because life circumstances didn’t allow them to as it was happening. I’ve taken the time to grow my skills as my kiddos have grown. I’ve tried to do it on my own terms and in my own way so that I can stop along the way and be part of life, be part of the minute little changes taking place daily, but observing the change doesn’t make you miss the way it used to be any less. Things have changed…the way they play, the way we spend time together…the ways I spend my time while they are at school. But I miss it. I really do miss the precious minutes just being their all. Can you relate? Will you describe an ah-ha moment you experienced as your kids have grown? Every once in a while I get homesick for my childhood home. Do you? 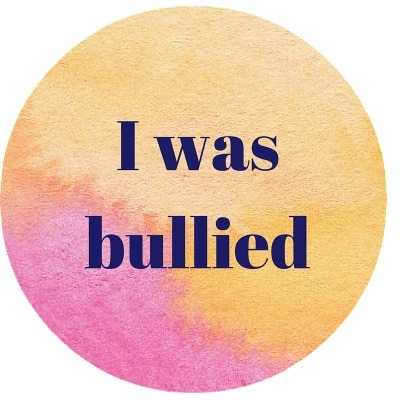 Last week I posted about being bullied as a child and ever since then I’ve been thinking about the freedom I was given as a child (and secretly hoping my kids will have some of the same experiences I was given – and subsequently wondering if I’m give those opportunities to them, or if I am hesitant for fear of what others may think.) It’s also left me wondering if we feel a little bullied as moms in our mothering. Walk, Talk, Tell didn’t work for me, but when I was a child the world was different. There were no such things as the internet, cell phones (well, there was but they were huge!) or Skype. The world was safer. Parents weren’t afraid to let their kids walk to the store alone. There was a higher level of trust among strangers and acquaintances. Around here children must be five years old before December 1st to start Kindergarten in September of the same year. One of mine turned five in early January and the other turned five just days before the deadline. In most people’s opinions my kids started school ‘late’ because they were home with me watching the bus go by that fall they turned five years old. Maybe we are lucky that we are not Kings and Heroes, because we do not have to make the choices that Kings and Heroes have to make. 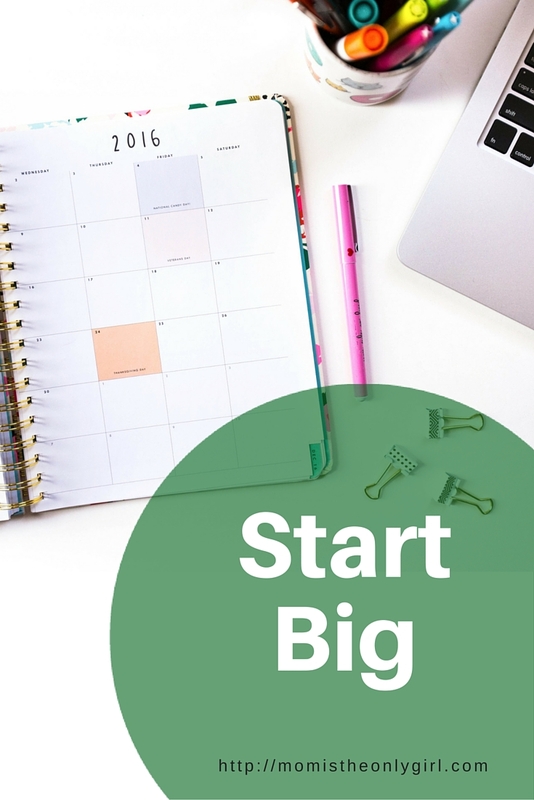 On Monday I shared about an easier way to achieve the goal and hinted at a couple of methods I’m using to get organized planning-wise this year. On Wednesday I referred you to Intentional by Grace and her planning 101 series to help get your calendar organized for 2016. Starting big! It’s one thing to plan to achieve the goal and to get things on your calendar so as not to miss birthdays, appointments and other important dates. (Starting big!) It’s quite another to actually work towards completing a goal and making those calendar items more easily crossed off as complete. So let’s get small! In very basic terms, mind-mapping is taking an idea or project you’d like to work on, writing it down in the center of a page, and then writing everything you can think of that needs to go into developing that idea around it. Then you break down every surrounding idea even further. It’s like breaking a big project down into steps, then breaking the steps down into smaller steps, then those steps into even smaller steps. I’ve done this mind mapping technique with a few huge projects to break them down into smaller, more attainable goals, and then broken those goals down into smaller steps and the projects don’t seem so huge or unattainable any more! I’ve also been doing this with everyday tasks that have only a few steps to them, and am extending it to my calendar items for this year. How does this apply to a mom? John’s birthday is on April 3rd, I wrote it in the other day when I was writing everything out on my calendar. Today I see it, and on March 26th write a note to ‘purchase and send card for John’s birthday’. You’re scheduled to take cookies to the Girl Scout meeting on February 4th. On the grocery shopping day right before that date write a note to check for ingredients. Then write in a date to actually make the cookies! For a mom, this process is like taking each calendar item you wrote in your 2016 calendar, and thinking about all the little things that go into achieving that one goal – the calendar item – and then planning them out step by step. Its like mind mapping and will help us keep better track of all the little details that go into accomplishing our everyday goals, as well as the really big ones! ~ Pull out your calendar and planner, work step by step through items on it, filling in what smaller steps can be done to help you be successful for each item. 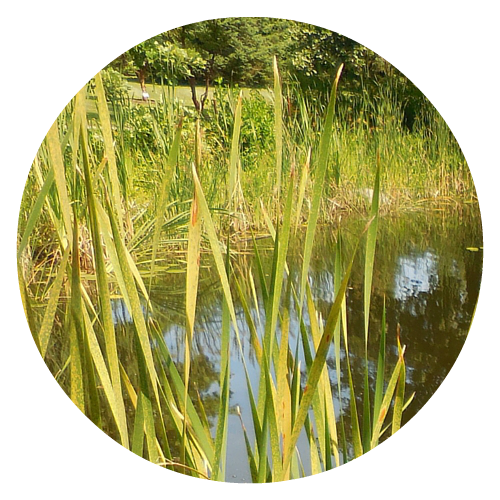 ~ Think of your goals for the year and do a little mind mapping. Then assign anticipated completion dates for each of your steps and add them to your planner! ~ Leave a comment below with your thoughts about mind mapping and the process you use to stay organized with all the details of small and big goals! *Please note I haven’t gone through all of the articles in the Planning 101 series, so this may be covered in there as well. I’m so excited about getting everything mapped out that I stopped after her first Planning 101 post! **Also, links provided are for your convenience only and are not affiliate links. They are resources I have used and recommend! This week we’re talking about how to plan for this coming year. I mean after all, moms need to be organized so we don’t miss an appointment, right? Its either really hard to know where to start planning or so easy to start, then get quickly discouraged, though, isn’t it? To get over this start big! Look at the big picture, the one that affects the whole family. The trick is looking at it in a way that doesn’t really seem so big, so ignore all the details right now. Let’s just think about planning out the basic 2016 calendar for the family. I’ve been following Leigh Ann at Intentional by Grace for a while and have stumbled upon her Planning 101 series several times. This year, however, I’m actually following the steps she shares to plan for the overall year for my family. Leigh Ann walks you through making sure everything for your family is on your calendar for the year so you don’t forget the little things! 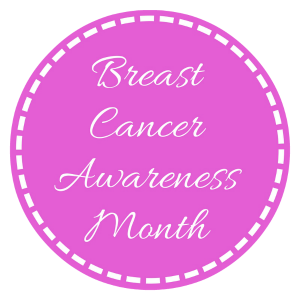 Go ahead and check out Leigh Ann’s post, and make sure you have your calendar ready! 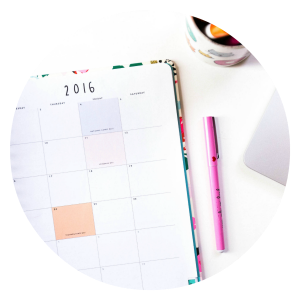 There are so many sources for printable calendars on the internet, but I like the printable calendar and planner pages at Scattered Squirrel! (I was going to make my own to add to this post, but came across these!) 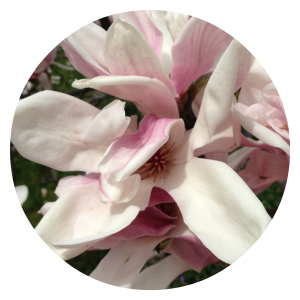 If you are a blogger and looking for a life and blogging planner, check out Wonderlass! 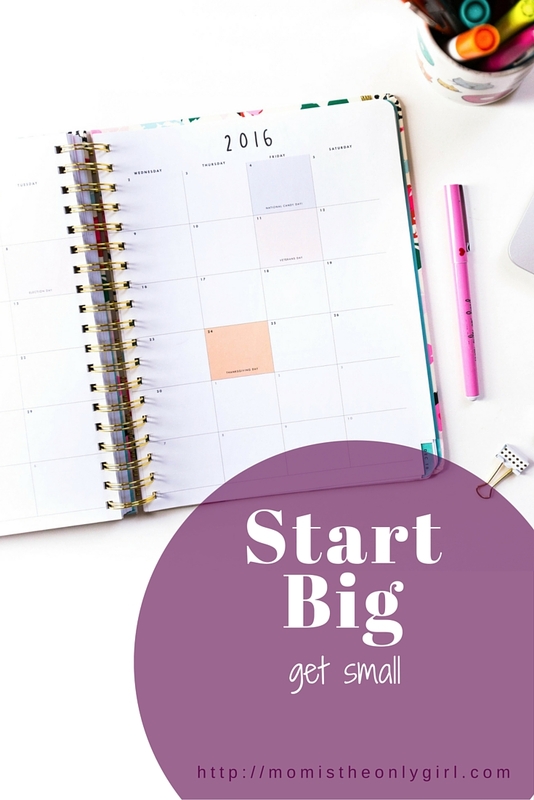 Come back on Friday to check out the way I’m planning to accomplish my goals and mini-goals! *Disclaimer: I am linking to these pages simply because I like them, these are not sponsored or affiliate links at the time of publishing. How many out there have made resolutions or goals for 2016 or have chosen a word for the year? I used to make resolutions, but wasn’t good at keeping them. I think maybe because the outcome didn’t matter as much as I wanted it to. Nothing would happen if I didn’t achieve my resolutions, except for me being disappointed, so they didn’t ‘stick’. Literally in more than one way. I’m on a venture to bring in an income while staying at home. I’m also using a different method than just making a resolution to hone in on achieving this goal. Abstractly this is a little hard. I mean, I haven’t actually gotten all of my thoughts together for my big picture. However, in reality actually writing things down and thinking about them in big terms is helping me figure out what the mini-goals should be, which in turn is making it easier for me to see the steps I need to take. Clear as a bell, right? How does this goal setting relate to you as a mom? The process to begin accomplishing each goal is very similar – outlining the steps to achieve it by setting and achieving mini-goals, and then outlining the steps needed to achieve the mini-goals. As a mom with little ones at home I yearned for a tidy home, but it just never happened unless I took steps to make it happen. The tidy home was my big goal. 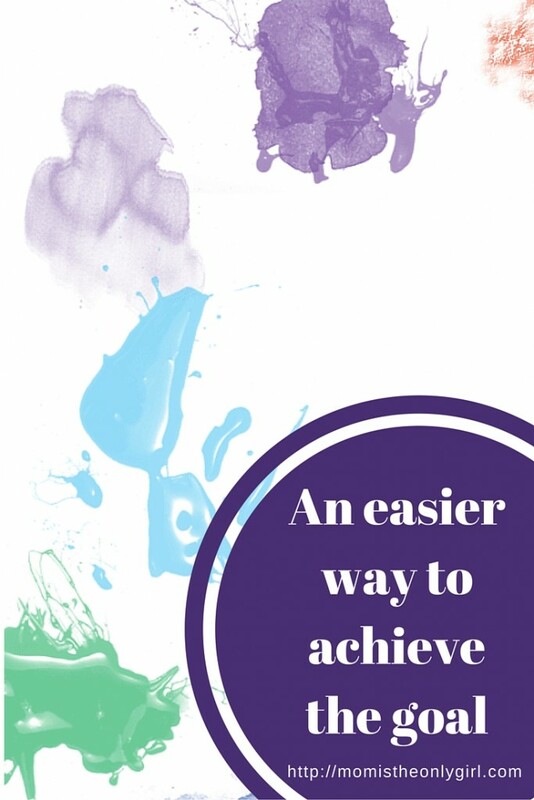 I broke that down into achievable mini-goals like doing the laundry (washed, folded and away), or sweeping/mopping/vacuuming and consciously worked toward them taking small steps to accomplish them. I never managed to have a tidy home for long, but it was much easier to achieve while taking steps to achieve my mini-goals than just haphazardly working toward my big goal. The mini-goals helped me stay focused. I’m not saying you have to maintain a tidy home, or that you have to try this goals/mini-goals method. I’m just suggesting if you have a hard time achieving a goal maybe this is a technique to try. Maybe start out simple and just pondering what your end goal is and then go from there? 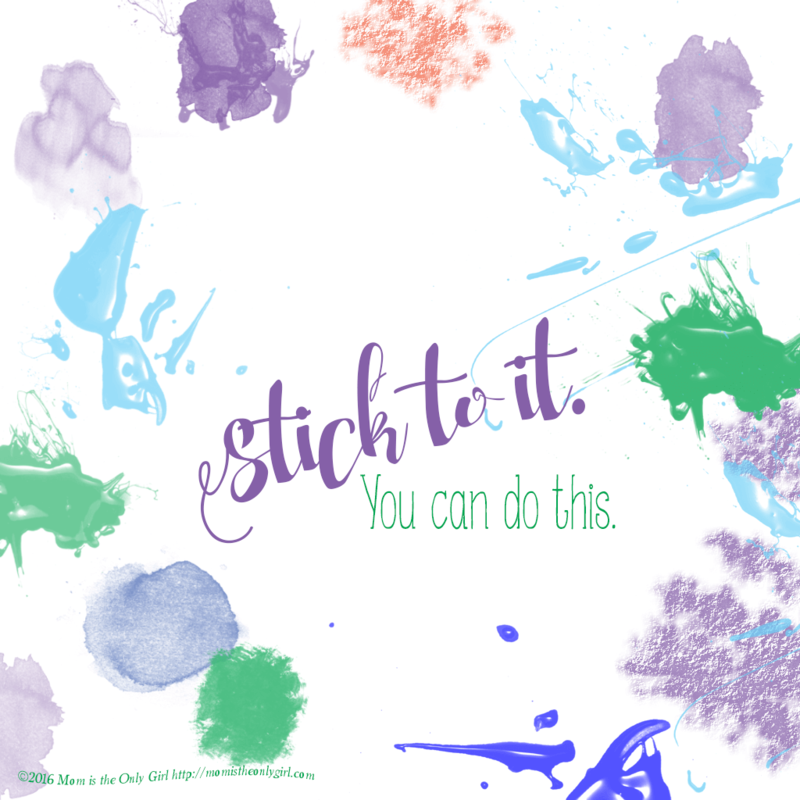 Whatever you do, stick to it! If you don’t stick to it to begin with, it won’t be achieved anyway! Look at what you’re trying to achieve from different angles, in different ways. If you are working towards a goal for 2016 and have your own way of keeping yourself on task, PLEASE share! I’ll be sharing again later this week how I used this little method to plan out 2016 for my family and would love to share links to what you’ve published about working towards your goals! Download this little reminder to Stick to It for your iPad! A mystery box was found in our garage. 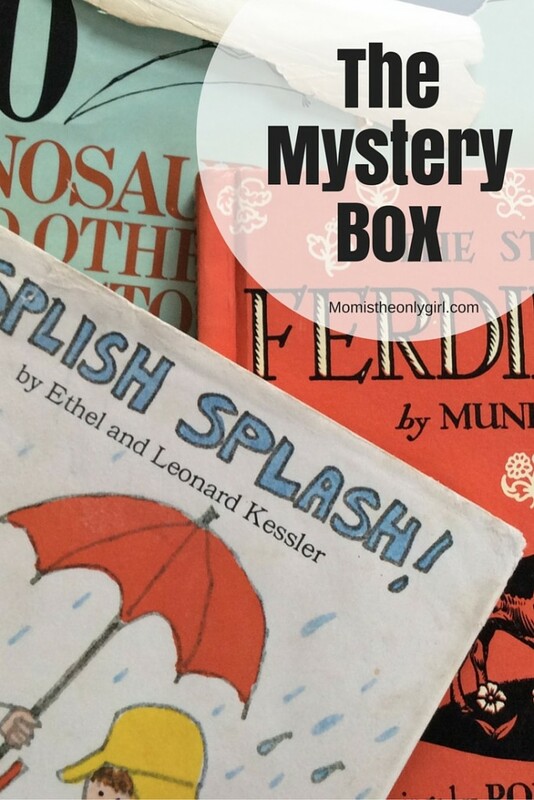 When Hubby opened this mystery box, he discovered his favorite books from childhood! 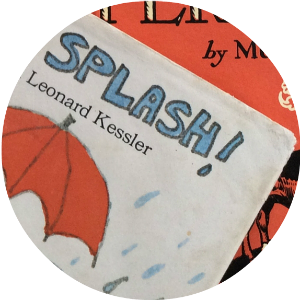 We’ve had fun reading Hubby’s favorites from when he was a kids… Ferdinand by Munro Leaf, Alexander and the Terrible, Horrible, No Good, Very Bad Day, by Judith Viorst, and Splish Splash! by Ethel and Leonard Kessler. My boys never really ask what we read as kids. When they ask us about our childhoods its about what computer games we played or whether there were actually school field trips waaaaay back when, so its been very fun to see their imaginations after reading these books! It almost seems appropriate to pull “old” books out around Christmastime, like pulling out photo albums around birthdays. The magic that appears during story time at night, all cuddled up on the couch reading books that are so familiar to the touch and to the ear….. Think about how you can introduce something familiar to you, maybe from your childhood, but new to your children this Christmas to bring about a renewed sense of wonder….and share it below! 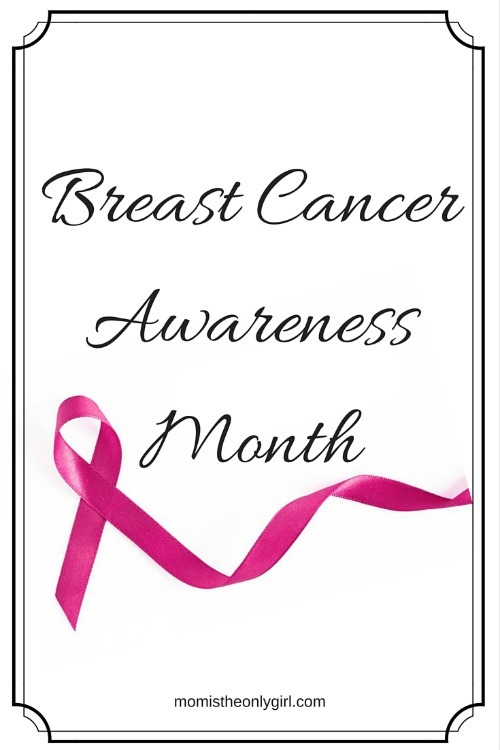 Its Breast Cancer Awareness Month. What do you get from a pumpkin? What if we ask you? 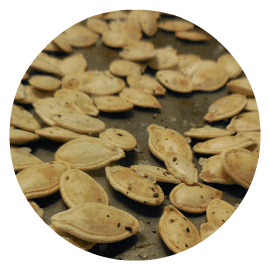 Last year we creatively stumbled upon a recipe for toasted pumpkin seeds! What’s that you say? You’ve never thought about eating pumpkin seeds? Neither had I until just a couple of years ago when hubby mentioned he used to eat them as a kid! Ever since then I’ve been searching for a recipe my boys would love and I think we’ve created our own! Have you ever dreamed of getting away from it all? Of having the time to pamper yourself a little and be a better mom as a result? 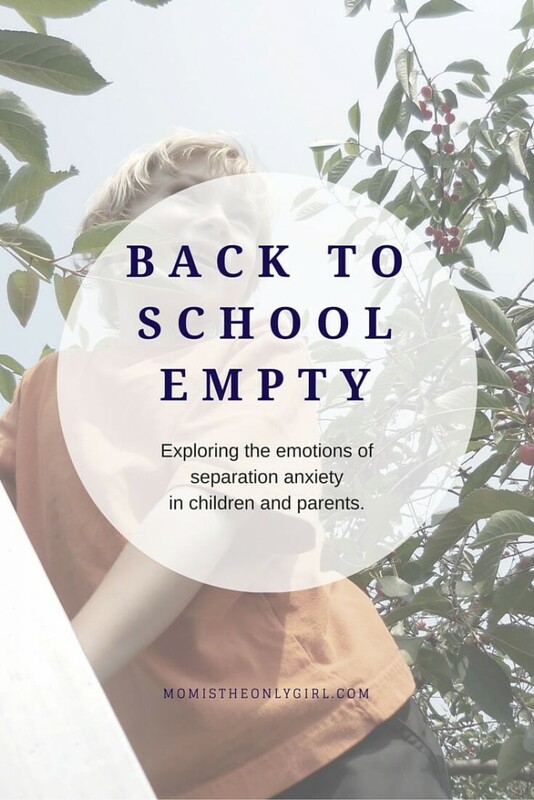 After an especially emotional morning, I find myself sitting here trying to get back into sharing with you fun new ideas after having taken our annual summer break. The thing is, I’m still trying to work through in my mind how to get over my emotional-ness. I feel empty. Back to school Empty. The moms have been wearing tank tops and work out shorts with their cute little shades and looking all ‘in’ when dropping their kids off in the expertly decorated VBS classrooms. They walk together in the hallways laughing at their little stories. They hang out in the back of the sanctuary talking quickly and giggling while the kids sing their final songs for the day. I imagine what they are laughing at as I watch them, secretly, while standing in the doorway. 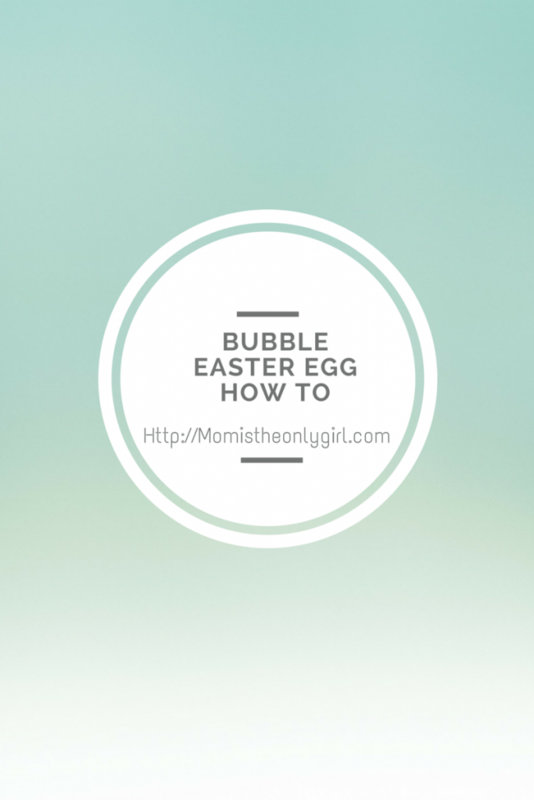 Friday I shared a simple Marbled Easter Egg Decoration how to. Today it’s all about bubbles! Its the middle of Spring Break for us, so I decided on something a little spring-like! We first made bubble print art in 2011. It was so simple and it is a great way to make Easter decorations with your little ones. He is warm in my arms, head cradled against my bicep as if he’d be looking at my cheek if his eyes were open like when he was a baby. Cuddled with his body close and still after having a wave of emotion and crumbling into a little crying heap in his bed as he was going to sleep earlier, I feel his steady breathing. I feel his body’s little twitches as it settles in and relaxes. I read this quote the other day and realized I don’t think this often enough. When my boys were younger I could so easily see things through their eyes as they were experiencing things for the first time. Now that they are older I find it harder to do, maybe because they aren’t having new experiences as often. Today, however, my boys and I are home alone (school conferences, so Hubby still has work) and I’m telling myself to see things as if I’d never seen them before, and as if I will never see them again. I tried last night as we sat at the sewing machine. They wanted to make beanbags…And I did find myself starting to be excited with them. If what we do is something I have experienced, how do I make this transition in my mind and find the excitement of seeing it for the first time? Hubby blows a path through the snow from our drive to the driveways on either side of ours for the mail carrier. (Yes, I’m still talking snow here in Rochester, NY, although it is finally melting and I can see just a little bit of grass poking through.) Our neighbors all down this side of the street do the same, so there is a path running near the front of every house from one end of the street to the other. Every morning we traipse through the path to the bus stop next door. Every morning there is a fresh set of paw prints as well, and I am pretty sure they run the length of the street. Coming upstairs I could hear Sweet Pea trying to open his bedroom door. I gave the knob a turn to help and saw him with his messy bed hair stooped over trying desperately to hold onto about 15 of his lovies while also trying to scoop up another. Isn’t this just like how we often try to break through whatever we’re struggling with, while still juggling everything else? Some times we just need to let someone help us. As moms we have this false expectation that we have got to do it all. I think this is true for others in light of letting God in ~ why let Him in when we are managing? In both cases we are so caught up in getting through that we can’t see there is someone who can help. It’s ok to ask for help, just like children do. Sometimes that’s the only way we can make it through whatever we’re dealing with or trying to accomplish. Are there things other family members can do? Are your kids actually old enough to help with a few things? It’s not only good for us to have help, it’s good for our family to see we are not the SuperMom they think we are. It makes us a real-life example for them. It shows them we are vulnerable, real. And this makes us stronger. So Beautiful Mom reading this, be strong and ask for help. I know it’s hard, but it’s a good hard. 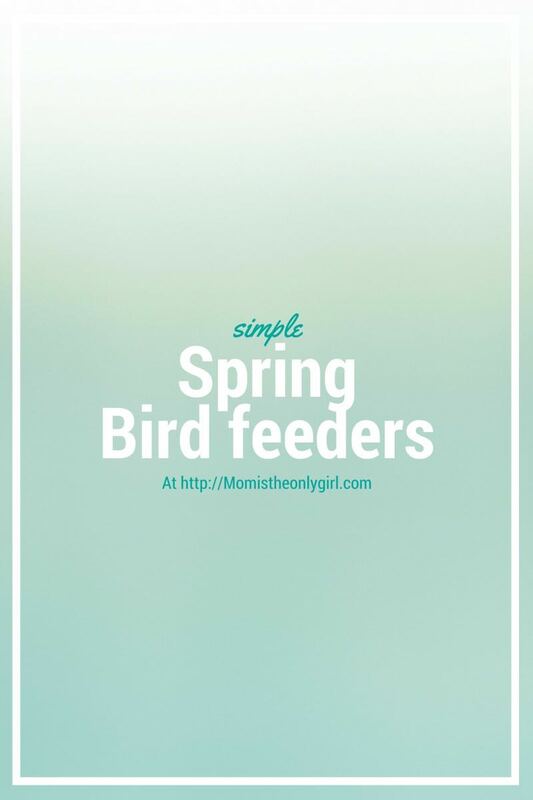 We made spring bird feeders the other day. Crazy, I know, since there is still about 3 feet of snow on the ground, but we are beginning to see and hear some birds around! Since everything is still frozen, we decided to make bird feeders so our migrating friends won’t starve! This method of making bird feeders has been around a long time, and was even put into song by Tom T. Hall in the early years of my life. (Scroll to the bottom to find out who he is!) Hubby even has a picture book that goes along with the record which he kept from his childhood! 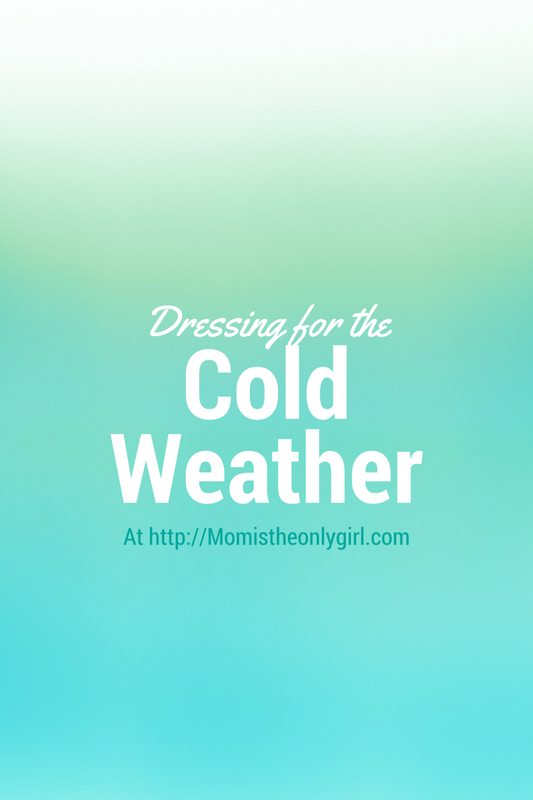 Hopefully spring is on it’s way, but all of this bitterly cold weather has me still thinking about dressing warmly! I’m going to share what I wear in these temperatures as well as some safety tips for playing outside with the kids (because we know it’s not good to be outside for very hat has been officially called the coldest month of February on record. Some days we’ve had a windchill of 30 below zero, with temps not reaching above zero for a few days in a row. Of course, today it’s 30 and we are expecting some freezing rain tonight! Anyway, feel free to post this to Pinterest for next year’s cold weather reference! Last week I showed photos of our winter break. There was one creative activity that I just had to come back and share with you. 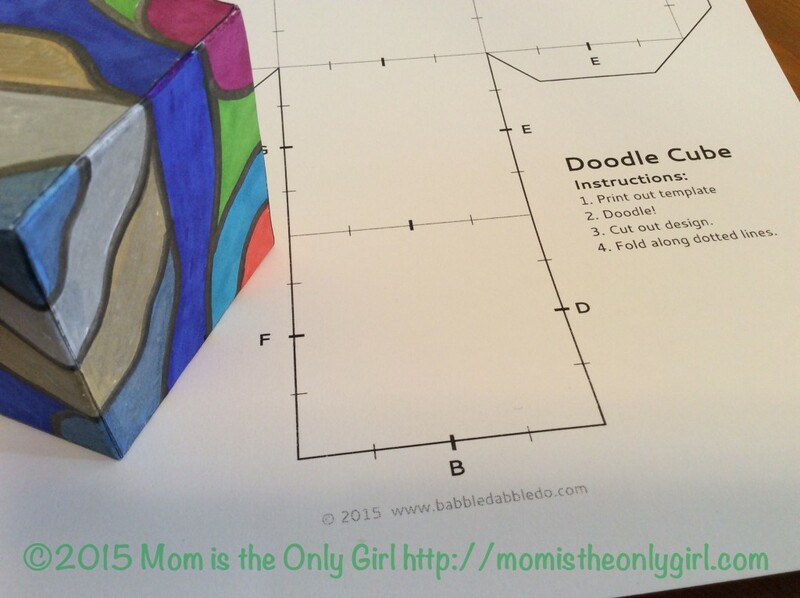 Doodle Cubes*** from Babble Dabble Do! Coloring these was sort of a cathartic exercise for me, so I decided to post it today, a day of the week I usually reserve for a mom-related topic. Ana at Babble Dabble Do titled her post for these as “Drawing Ideas for Kids”. I initially thought I would just give the printouts of these to the boys and we could create together. Possibly getting a little more involved than just coloring one and leaving it at that. I had this great idea that we could be really creative and color two or more to have them stack creating a picture. Of course, things didn’t get that far before 6 year old Sweet Pea decided he wanted to create something out of Minecraft (current obsession) and decided he didn’t want to work as a team with me. I pulled out my own markers (Sweet Pea likes to pop the ink part of his in, rendering markers useless) and got to work. Oh my was it addicting! Go ahead and make your own Doodle Cubes! Just the thing for you to color alongside your little one! (Then you can both play with colors, improve your coordination and improve your fine motor skills through coloring and cutting!) Try to create a picture so when the final cubes are stacked you can see it! I challenge you! 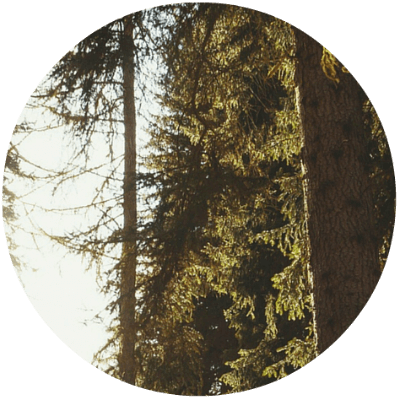 ***I in no way want to take credit for this activity and am referring you to the original site for the printable…if you have positive comments about your experience creating with these I would love to hear, but I think Ana would even more! Sometimes we try hard to make our activities fit into a certain routine. It might be easier to alter when we do certain activities to make things flow better. We’ve been talking about daily routines/daily rhythms this week. But what about weekly rhythms? In the years I had two boys at home with me and a hubby at work all day I developed a few routines that I continue today. Not out of obsessive habit, but rather because they work for me, for my family. I stumbled upon them quite innocently enough and thought maybe some of you might want to hear about them, maybe they might work for you. I’ll be sharing a few this week, but I tend to group them into what I call my weekly and daily rhythms rather than calling them routines. It is great to build routines/rhythms, for more than just yourself! Keep reading to find out why! Are you trying to figure out your daily rhythm? If you’ve got little ones at home, it might be helpful to discover your child’s daily rhythm as well! When my Cutie Pie was a little tiny baby I had a difficult time discerning whether he was hungry, tired, or overstimulated. I know this is something a lot of parents can tell naturally, but I just couldn’t. When he was just a couple of months old a friend gave me the best book, The Happiest Baby on the Block by Harvey Karp, M.D. It was just what we needed! It is so important to include meal planning in your daily rhythm. When you review your two weeks on the daily time tracker I provided yesterday, you will undoubtedly notice you spend time preparing meals regularly! Why not make this part of your day by planning for it? There are so many meal planning resources on the internet that I won’t try to add to them with explanations or printables of my own. Instead I will share some of the sites for you to click to and explore which might work for you along with a few tips to meal planning. Seemed like clockwork hubby would run out of milk on a Sunday night, so it became habit to go grocery shopping on Monday mornings. Did you know hardly anyone is in the grocery store I use on a Monday morning at 9? Seriously. The. Best. Time I found to cart two (possibly unhappy) boys through a grocery store! (And I could use the excuse that it was ‘still morning’ when they asked for candy. It’s a rule in our home – no candy before lunch is eaten.) This became part of my Monday Daily Rhythm. I found it so helpful to take the time to review my week for several weeks in a row to see if there were routine things I was doing without realizing it. There were! Do you have a routine to your day? Some sort of routine that you follow so your kids know what to do and what to expect everyday? I like to call it our daily rhythm. My Cutie Pie has always been a creature of routine. Now that he’s in school the routine has changed but it’s still there. I like to think of it more as a rhythm, because it’s just the pace we go through the day. It is not necessarily a routine, because sometimes we do switch things around. Mom’s Monday Post! Mondays I post specifically to encourage moms. It’s encouragement for whatever stage you are in right now, because it is focusing on you, not your little (or not so little) ones. 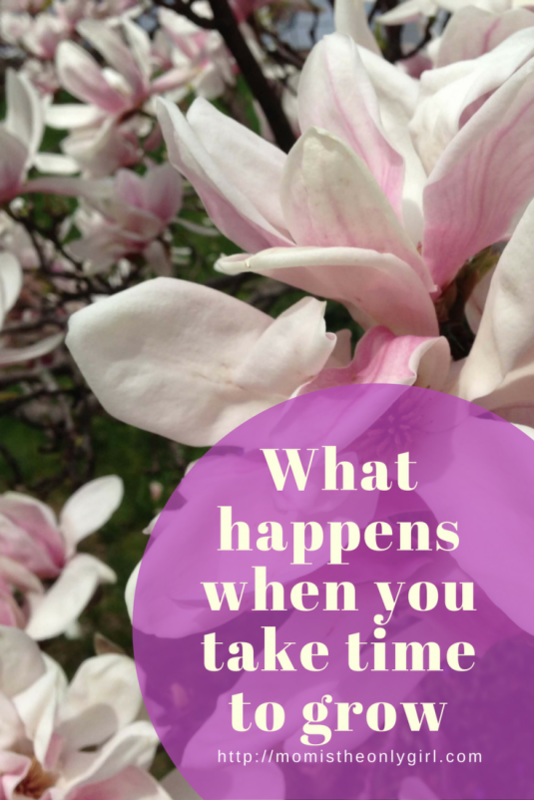 Take a few minutes to yourself and ponder today’s post. 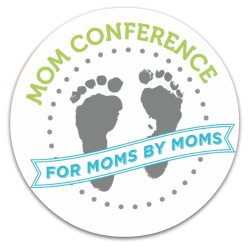 Several months ago now, I watched a few videos provided by the SuperMom Summit. The one main theme that kept repeating (to me, at least) was that we need to give ourselves time to dream so we can work towards our dreams. We need to value ourselves. We each have unique gifts and talents, but if we don’t value ourselves enough to take time to nurture our gifts and talents then we won’t have time to dream. Dreams are real! Such huge ideas for us as moms, right? Our focus is always on taking care of others. One video featured Nicole Carpenter from MOMentity, where moms are encouraged to ‘dream in motion’. Keep your dream alive now so when your kids are grown you aren’t thinking ‘What about me?’ Some days I sit thinking about what I want to be now that my kids are in school and I think that’s where I find myself ~ having let my dream go and not knowing what to do now. If we don’t set our own goals or have our own dreams we’re not being an example for our kids in this area. This thought took me back a bit. 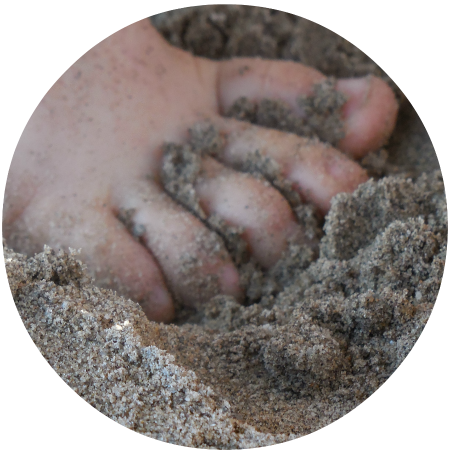 Do our kids really see this area of our lives as an example for them? But then I remember the times my boys ask me why I ‘work’ all the time doing chores and realize they do see me always putting others first, but not investing in my own dreams. Now, I know not every mom is the same. Some have regular nights out with their friends, or take classes at the sewing store, or whatever. However, some moms continually invest in others and don’t realize they are depleting themselves. It’s not an all or nothing for either of these scenarios that make us great moms. Its simply realizing that unless we take at least a little better care for ourselves, we won’t be able to give our best to others and our dreams will become figments of our imaginations. Next week I hope to spend several days posting about routines…and how they can help us find time to dream! Remember, dreams are real. What is your dream? Have you noticed that every Monday I’ve been trying to bring you a mom-centered post? I am all for sharing ideas for our kiddos, but I think we need to nourish ourselves as moms, too! Do you have a morning routine? I don’t mean trying to get the breakfast on the table and the kids to school on time. I mean do you, yourself have a morning routine? A few minutes to prep yourself for the day ahead? Last week I invited you to join me in making our lives a little more positive, being more prepared for each day. More ‘intentional’ if you will. This is the first post in this series which I will bring to you every Monday for several weeks. 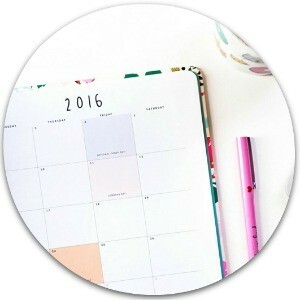 Paula at Beauty through Imperfection posted last year that she schedules playtime in her planner. 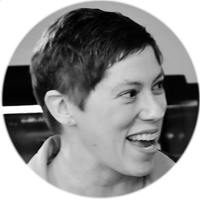 She is a visual person and in her post says she likes to see tangible results (like after washing the dishes or doing the laundry). There is no start or stop to play. No measurement. She stresses its so important and shows love to her kids in a way that only playtime can, and that’s why for her personality she schedules it in her day. 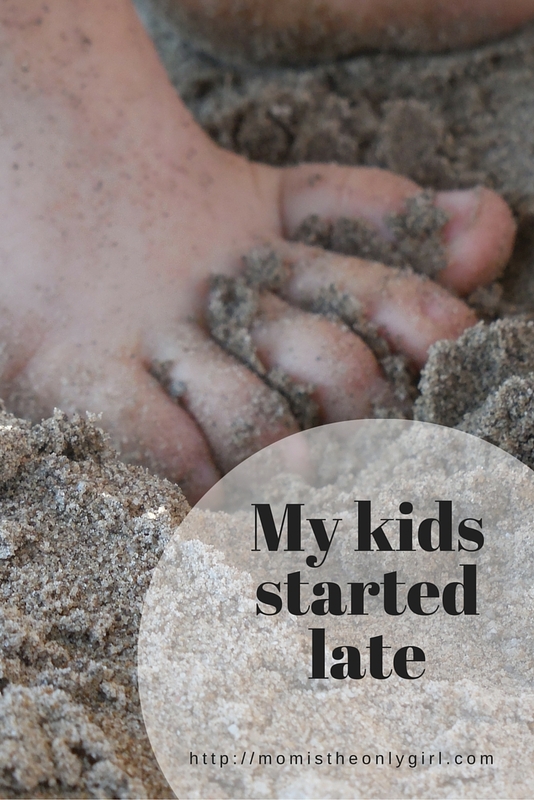 When my boys were small I went through a phase where I would see everything around me, see them content playing and decide to do “chores” rather than read or pull out the play dough with them or even just sit with them while they played. After a few days my oldest, then 3, said ‘Mommy, you don’t play anymore.’ Major guilt trip and then I tried to be more intentional about being with them. That’s been happening a lot to me since coming down with the flu. I get tired so easily and those little things keep popping up placing doubts in my head as to if I am sane or not! In past years I printed out the little forms for everyone to fill out on New Year’s Day and this year was no different. (I used these cute forms from Thirty Handmade Days this year!) 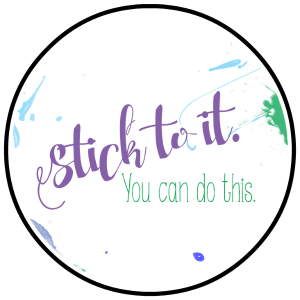 For myself, I focus on trying to figure out if I actually accomplished anything the previous year (other than keeping myself, Hubby and the boys alive for another year!) to give myself a little value. Having my boys fill them out is a great way to capture their thoughts and in the future we can look back and see a big picture of how they grew. Happy New Year! Ahem…The holidays were different this year. If you are following along on Facebook, you’ll know our family came down with the flu in time for Christmas. It never fails, really, for us to get sick on break. I think a lot of teacher families can say that!